This online gable greenhouse calculator is intended for the estimation of the materials needed to build a greenhouse with your own hands. To do the calculations, you should know the parameters described further. 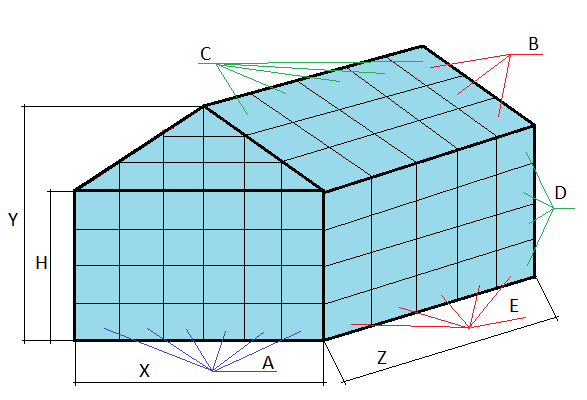 E — Number of walls sections. You can change the number of the units and sections to adjust the size of the greenhouse to the most optimal one. You will get the calculation of the units’ size automatically. The result of the estimation is the volume and square of a greenhouse, basement perimeter, and amount of the materials for the frame and the area of the glazing. After you have finally decided about the construction of the greenhouse, you can select the covering material. There are numerous options offered today at the market. Different panels: if this case. you are likely to select among polyethylene semi-rigid panels or flexible rolls, acrylic rigid panels and vinyl. Producers recommend to use the latter one only for the showrooms to make a clear and nice view of the facilities when you have visitors and never use it for the roofs, on the contrary the acrylic panels can become a good solution as the material is resistant to snow and even hail impact, strong winds and it can last long, which is suitable for the commercial solutions. Glass: for a long time it was the only alternative. It provides greater light transmission than any other kind of the covering materials, but it is a poor insulator leading to significant heat leaks unless you use double or triple panels. The improved solution is tempered glass. Polycarbonate: it is reliable and affordable type of the cover. It also provides high light transmission, which approaches to 80%. Almost all polycarbonate products contain UV protectant and can resist high impacts. In addition, the glass greenhouse can be easily modernized with the polycarbonate sheets. Besides, it is flexible material and can be adjusted to any shape. It requires simple maintenance and easy care. By these panels, you can assemble your greenhouse fast even if you have no special skills. Plastic: here we talk about the fiberglass reinforced plastic delivered in the form of rigid plastic panels. It is more popular today than it was in the past. This covering material is featured by flexibility, better resistance to breakage, higher light diffusion but it is prone to fast abrasion of roofs leading to pitted surface. There is one more type of the covering materials – polyethylene film. It is cheap material, but most of the available plastic films last in general about two years before it requires replacement. You cannot use the present calculator to estimate the amount of the film you need, but it does not seem to be a problem, as this cover is not widespread for the gable greenhouses.